Active Call Controls are soft keys that would allow you to use various features on your Office@Hand desktop app. 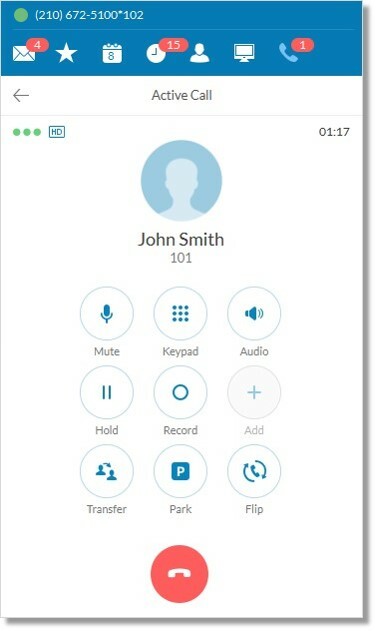 Active call controls include Hold, Record, Add a person to the call, Park, Flip, Transfer, Mute, Keypad and End Call. The Mute button allows you to mute or unmute your mic’s volume. The Hold button puts the other party on hold. The Park Location button allows you to park the call on a set park location where any User in your account can pick up. Go to the Sending a Call to a Park Location section for more information. For more information, go to Using the Call Flip Feature. When you add people directly to the call on the Office@Hand Desktop App, it’s called local conference. These calls are reported as one-on-one calls in the call log and is limited to seven (7) participants. With the Promotion to Conference bridge feature, Users will be able to increase the number of conference participants when necessary. See Office@Hand: Promoting Local Conference on the Office@Hand Desktop App to learn more.